Living Legend Sachin Tendulkar - A site from a die hard Sachin Tendulkar Fan: Sachin Tendulkar meets Sachin Anholt. Sachin Tendulkar meets Sachin Anholt. It is every fan's dream to meet the legendary Sachin Tendulkar and for one lucky fan (Sachin Anholt) in Christchurh, New Zealand, it was a very special meeting with the Master Blaster. Sachin was born into Nick Anholt and Veda Austin's family, who have absolutely no Indian ancestry or connections with India. However, for this cricket-crazy couple, naming their son Sachin was not much of a trouble. 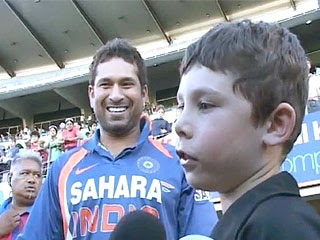 A big Tendulkar fan himself the Christchurch born 7-year-old Sachin Austin has been named after the man himself, and during the third ODI between INDIA - NZ the young lad had the opportunity to meet with Tendulkar. Expressing joy in receiving Tendulkar's autograph, the young Kiwi said,I am happy to get this autograph and I am proud to have his name. I want to be a cricket star when I grow up. Sunday's match, where Tendulkar scored a mammoth 163 not out, was the first time young Sachin witnessed an international match. Little master Tendulkar has inspired a generation of fans not just in India but all across the globe. It is not just fan clubs that the Master Blaster's 20-year long career has inspired but also those who await eagerly to meet their hero. Awesome. What luck for that little boy. Wish I could meet the master too someday.